Send tasks and updates between two applications allowing emails to be saved as tasks - enabling you to spend more time with the real work. TimeTrak allows your Service Coordinators to seamlessly convert emails into tasks, update tasks with email conversations and assign existing emails to tasks. This ensures your field technicians are always kept up-to-date and your jobs have accurate information at all times. As a web-based time management solution, you are able to synchronise your tasks to your calendar while out in the field. 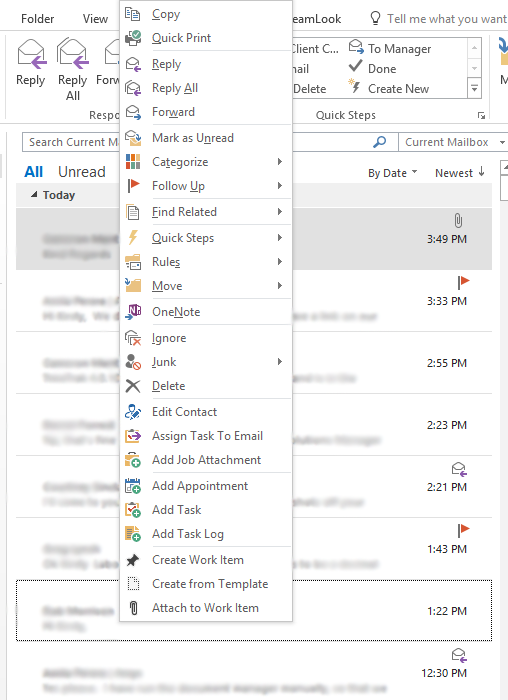 As soon as your team are assigned a new task this is uploaded to their Outlook calendar, no need for them to come in to get their next job, or to disrupt their day with a phone call. View future TimeTrak appointments in Outlook as soon as they are created - keep on top of your team's calendars. TimeTrak Outlook Add-in gives Service Coordinators full visibility of their teams schedule and calendar - reducing double bookings and allowing for more efficient days. This allows users who possibly do not have a TimeTrak login to manage staff via Outlook as well the ability to see if a user has leave booked in, preventing them from being double-booked. Despite the "ditch" Exosoft are extremely responsive in further developing TimeTrak and TaskTrak Professional to suit our service solution and are always professional in their approach to providing us with value added options and better solutions..